SDA & SCL pull-up resistors have been removed. Despite the ease with which I got the DS18B20 one wire temperature sensor running, I would prefer to use all I2C sensors for a modular system that lets me swap the data logging platform and the sensor housings in the field. 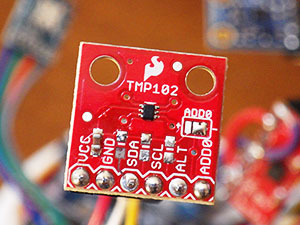 The Texas Instruments TMP102 is very low power 12 bit sensor capable of reading temperatures to a resolution of 0.0625 °C and Sparkfun sells them on a breakout board for only six bucks. There are plenty of basic starter scripts out there that just read the temperature register, and leave the units running at the default settings. However for my long term deployments I really wanted to make use of the “one-shot” mode that this sensor supports, where the unit auto-sleeps by default until you ask it to make another reading. While this doesn’t save that much power (it brings the sensors quiescent current from 10μA down to 1μA) I figured it could also reduce the noise on the I2C lines, and the BMA180 accelerometer that shares those lines is sensitive to absolutely everything. For those who just want a library for this sensor, there is one here and here , but I wanted a more transparent approach, because sooner or later, I will need to integrate all my individual sensor scripts into the next Cave Pearl codebuild. If I hide my functions in a library, it will be that much harder to see where duplication might be eliminated. Because this sensor stores data in 16 bit registers (outlined here, but their code is somewhat confusing) , you have to do some juggling to reconstitute the data after reading out two register bytes. This gets a little complicated if you reach temperatures below zero because the negative numbers are represented in binary twos complement format. Fortunately that is not an issue in caves, and the twos complement stuff does not need to be done on positive numbers. You also don’t need to get into the 13bit “extended” mode of this sensor unless you are measuring temperatures beyond the normal –25°C to +85°C range. 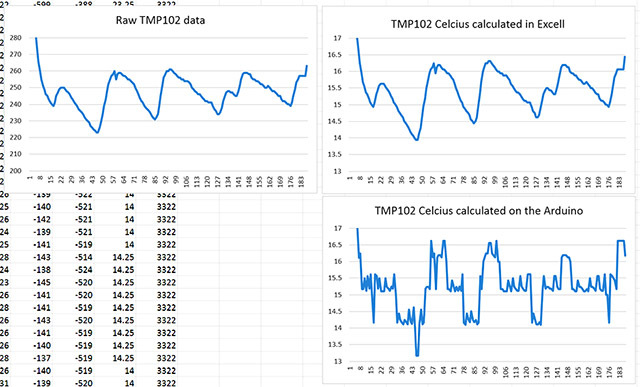 If I have issues with the TMP102, I may try to get a hold of a TMP112 which is code compatible, and has a slope specification that can be calibrated for better accuracy. It’s possible that I caused this problem by forgetting to use proper casting in the calculations. but just in case, I am going to avoid float calculations on the Arduino. You can always save your “raw” sensor data for processing later. This entry was posted in * Developing NEW sensors * on June 17, 2014 by edmallon.